Some fashion ideas can truly stand the test of time! These unique checks feature the damask weave. It was a style that originated in the early Middle Ages in the Arab city of Damascus. The wonderfully ornate floral patterns were created on looms by expert artisans. The damask designs you see on this set of checks were inspired by those woven centuries ago. Damask Pattern Personal Checks from CheckAdvantage feature this classic look in four different color combinations. 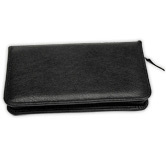 Decorate your checkbook with this stylish choice! Get Damask Pattern Personal checks today!